Nefertiti, the "Johnson Jumper" spider hunting for flies inside her habitat on board the International Space Station. Now back on Earth, Nefertiti will live out its days at the Smithsonian National Museum of Natural History’s Insect Zoo. A jumping spider has made the leap from floating in space to springing into the Smithsonian. The "Johnson Jumper" ("Phidippus johnsoni") spider is the first of its species to return from a mission into space and successfully readjust to life on Earth. Named "Nefertiti," the arachnid astronaut, or "Spidernaut," lived for 100 days aboard the International Space Station. Its mission over, the spider has now landed in the "Insect Zoo" at the Smithsonian Institution's National Museum of Natural History in Washington, D.C., where it will live out the rest of its life — estimated to be about six months — on display with other live arachnids and insects. "The Insect Zoo is one of our most popular exhibitions, and we are thrilled that having such a great educational space also gives us the opportunity to host a critter as special as this space-traveling spider," Kirk Johnson, the Sant Director of the National Museum of Natural History, said in a statement released by the museum. "And don't think it's lost on me that the common name for this spider is the 'Jumping Johnson'; we're practically family already!" The Spidernaut's flight was the product of YouTube Space Lab, a worldwide science project and contest that invited students to submit two-minute videos suggesting science experiments that could be conducted by the astronauts on board the space station. 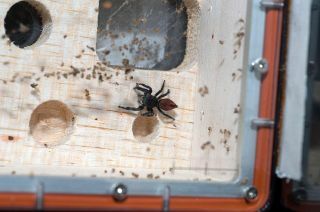 One of the two experiments that was chosen through the online contest was whether a jumping spider could adjust its natural hunting technique to still catch its prey in the microgravity space environment. Proposed by 18-year-old Amr Mohamed from Alexandria, Egypt, the spider chosen for the mission was named "Nefertiti" in honor of Egypt's ancient history. From July through October, Nefertiti was observed in orbit by NASA astronaut Sunita Williams and by researchers on the ground. In total, the jumping spider circled the Earth about 1,584 times, traveling 41,580,000 miles (66,900,000 kilometers). "She is sort of scary; in fact I am so glad I am not a fruit fly," Williams wrote while aboard space station. "I opened up the habitat and actually saw her running around at full speed looking for something to eat. It was difficult to even get a steady picture." "Then a fruit fly came out," she wrote. "Nefertiti stopped, she stalked and then she pounced. It was amazing to see this with my own two eyes." Despite the changes in Nefertiti's environment, the result of the experiment was that it was indeed able to adjust its feeding behavior to account for the effects of "zero-g" and still catch its prey. "This spider, and the idea behind flying it in space, bears witness to the breadth of imagination in young, inquiring minds around the world. A student in Egypt wondered how a spider that jumps to get food on Earth would react to microgravity. The result was a 42-million-mile journey for Amr's spider all the way to the International Space Station and an inspiration for the students who visit the Natural History Museum to become inquisitive about space," said William Gerstenmaier, NASA's associate administrator for Human Exploration and Operations. Nefertiti, or "Neffi" as friends call her, is now living in the Natural History Museum's O. Orkin Insect Zoo, a special exhibit hall where live insects can be observed. Displayed with Neffi is the actual spider habitat that was used aboard the International Space Station. Though the first jumping spider to come back from space, Nefertiti is just the latest arachnid in the spidernaut corps. In fact, living on the orbiting complex at the same time as Neffi was another eight-legged friend, a zebra spider called Cleopatra. Neffi is also not the first spidernaut to land in a museum. Anita and Arabella, two female cross spiders ("Araneus diadematus") were launched to Skylab, the United States' first space station, in July 1973. The subject of another student science experiment, they were the first spiders to spin webs in space. Unfortunately, unlike Nefertiti, both Anita and Arabella died during their mission. Despite their untimely demise, they were transferred by NASA to the Smithsonian National Air and Space Museum in Washington, D.C. in 1974. Anita is now on display at the Air and Space Museum's northern Virginia annex, the Steven F. Udvar-Hazy Center, in its McDonnell Space Hangar. Meanwhile, Arabella was loaned and exhibited at the U.S. Space and Rocket Center in Huntsville, Ala.
Click through to collectSPACE.com to see video of Nefertiti, the “spidernaut,” catching her prey aboard the International Space Station.